Hugo & Otto's Portreath Rattan Dog Bed is in itself a beautiful piece of furniture skillfully hand made in a double rattan core and available in 2 beautiful colours of rich honeyed natural or in a contemporary cool grey. A raised dog bed is wonderful for dogs who just love to look out of the windows to keep a careful eye on those pesky fur balls who dare to infiltrate the garden and of course the other eye on what is happening in the kitchen. The raised position offers an advantage over other dog beds that sit on the floor, offering dogs who get hot with underfloor heating a cool platform to snooze and those who like to feel safe by being up high a super retreat. And our Portreath has very elegant deep inner walls keep your dog cosy and warm which is especially good for hound dog breeds who just love being cosy and covered up. Choose the colour combination of contemporary cool Rattan Grey Wash or the Rich Honeyed Natural Rattan and combine them with our stunning Harewood Dog Cushion in 4 colours. The Harewood is made in Parquet a beautiful British made Pure New Wool fabric by Abraham Moon inspired from their historical fabric archives. Each piece is handmade in a wonderful craft centre in Mayanmar that is certified, licensed and approved the families that have worked proudly for generations produce excellent quality. Our Rattan Core is carefully selected and air dried over months, it is very strong, durable and amazingly easy to clean. Simply dust off with a dry cloth and clean away muddy paws marks with a soft damp cloth in a mild soapy detergent. Spring Clean on a lovely dry day, simply take your rattan dog bed outside and wash down then let it air dry naturally for a few hours, but please avoid harsh abrasives and strong bleach or detergents. A little note - we would never recommend a Rattan Dog Bed for a new puppy - they are just like babies and have teething problems and prone to chew. 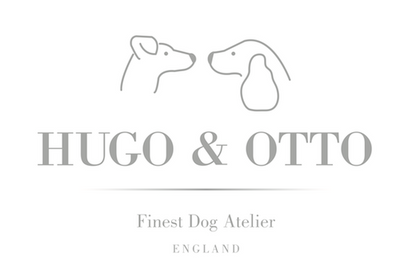 Equally, there are grown up pups out there that love a good chew on a leather shoe or anything hard and so if you have a chewer we would recommend our beautiful Hugo & Otto dog bed ranges instead. Shipping Costs are fixed for the UK & Northern Europe - for worldwide shipping we go where DHL goes but we do need to cost this for every shipment with the Couriers as fuel costs vary and so please email us sales@hugoandotto.com to request a shipping quote.